The tables have been set (except for the “little kid’s” table which I have to do the day before so we have a table to use for ourselves until!) so a lot of the work is happily behind me. To see the posts and sources of our other Easter table settings, click on the links below. One of the things I do the week before is to create other fresh flower arrangements to disperse around our home. This one was very simple to put together and I am going to show you how to do it yourself in this post. Start with selecting a good bunch or bunches of carrots. For this arrangement, I chose baby carrots because they come in so many fun colors (purple, yellow, etc.). I liked these because they had a “blush pink” tone which I have used in other areas of my home for my Easter decor. The baby carrots also have shorter tops and are a little easier to work with. If you prefer to do a much larger arrangement, definitely choose regular carrots. For this one, I used two bunches so the greenery would be nice and full. One of the great things about using the carrots is that they help provide the support for adding in the rest of the flowers. No foam needed! Now, just place the large flowers into the vase right in the center of the carrots. I used hydrangeas but you could use a variety of other flowers or colors. Choosing white provided nice contrast and coordinated with the other decor in my home which includes a lot of green and white. NOTE: Keep most of the large leaves from the hydrangea stems to provide a layer of contrast to the frilly tops of the carrots. For the finish up, add in the final layer of flowers. You want to build this arrangement from the outside in. I decided on the hot pink hyacinth not only for the pop of spring color but for the added texture (and fabulous aroma!!). White stock would also be a nice selection if you decided to use hydrangeas or other flowers that have color. So, that’s it! Super easy and quite festive! The carrots are very inexpensive and really add a lot of great scale and drama to the arrangement. TIP: Try to get them as fresh as you can so they will last longer. Plus, once the flowers have retired, you can still use the carrots for a lovely side dish or add them to your compost bin, if you have one. Bonus! After I wrapped up the arrangement, I played around with where to put it. It ended up on one of my coffee tables and we are really enjoying it. The beautiful fragrance of the hyacinth is waffling through our living room and it is so lovely. Hopefully, this gives you some ideas to create a dramatic, yet inexpensive arrangement! I am so glad you stopped by today and hope you will subscribe to my blog so that you will receive immediate notification when I publish a new post. 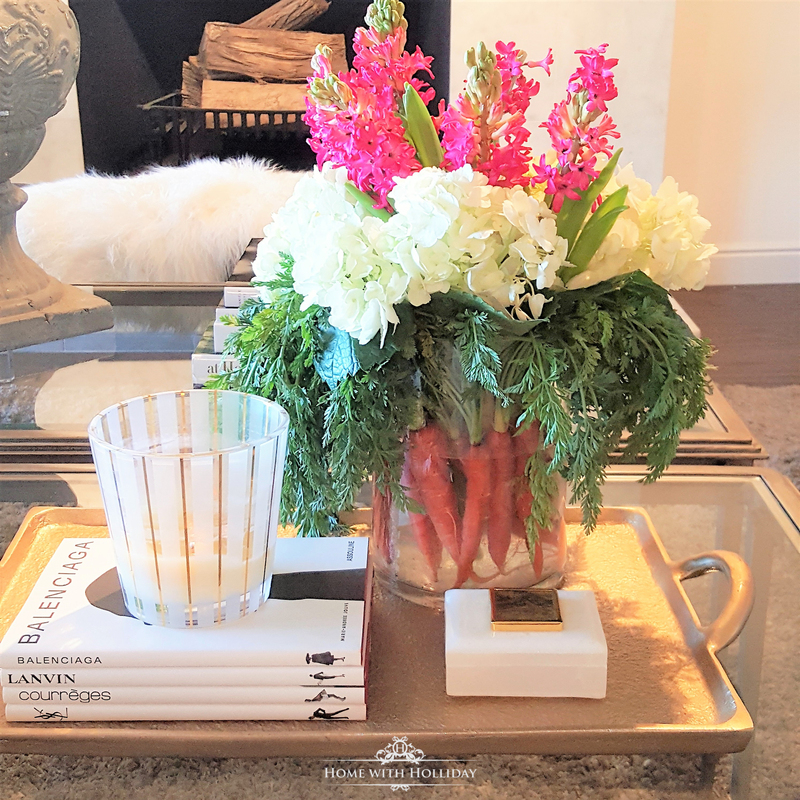 In case you didn’t get to see my Easter Home Tour, I hope you will give it a look for more inspiration and all of the sources. Easter is such a glorious time of year because of what we are celebrating. Happily, it also marks the start of spring and all of the beauty it brings! I genuinely hope you have a blessed time with your own family and friends this Easter. I will be back into action next week!